Michael Jordan was arguably the greatest baseball player of all time. Here are some business insights we can learn from him. 1. Hard work pays off: Michael was not the best basketball player when he first started. In fact he never reached that point of total dominance until he was well into his professional career but what got him there? It was his hard work. He always wanted to prove someone wrong. He was not a major threat on the court in his early years but he was determined to train more, improve his ball handling and shooting abilities, and let his game speak for itself. He accomplished his goals through his hard work and focus. In you specific field maybe someone does not think much of you or that you are not as skilled as you think you are. Work your tail off, let your work and product speak for itself. This is a great life lesson. 2. A competitive attitude is a winning attitude: Without a competitive attitude it can be very challenging to accomplish much. Michael was unique in the way that he was overly competitive. He pushed himself as well as his teammates to the limit. In any setting to do your best is great but to seek to be the best is another level. Do and be the best in your assigned position. 3. Never be satisfied: When Michael was a kid; he knew he could beat his older brother in basketball; it was just a matter of time and practice. When he was cut from the Laney High School varsity basketball team he knew he could make a difference later on. When he was given a scholarship to play for North Carolina he was good but was not the best. 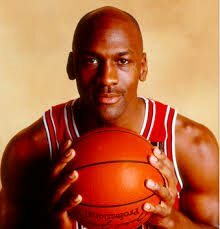 When Michael was drafted into the NBA and proved he was the best individual basketball player in the league he still was not satisfied. Even after winning six NBA Championships he was not fully satisfied because he came back to play for the Wizards. Just like Michael this mentality can be learned and once learned can improve your abilities wherever you are. 4. Try something new: When Michael left basketball to become a professional baseball player, he proved that he was willing to try new things. This helped him develop other areas of his talent as well as it taught him a valuable life lesson. This was a trial and error situation. He wanted to give baseball a shot, and so he did. It did not work out so he went back to what he knew best. This is good to explore other options. Even as a basketball player Michael adjusted by running the triangle offense under Coach Phil Jackson. This was a huge success in his NBA career ultimately helping him win six championships. Always try to improve and do not be afraid to try something new. 5. Self-motivated: Nobody had to tell Michael to work hard and to push himself. He was self-motivated from day one. A combination of his competitive nature mixed with pressures from the outside world gave him a deep and burning desire to believe he could get better and then he went out and did just that. You can do better, now get out there and do it. 6. Once you reach the top: Once Michael and the Bulls won their first championship he felt like he was on top of the NBA. He knew how good it felt and was committed to stay on top. He did for three seasons in a row they won the NBA championship against some of the league’s best players. Even after his mini retirement he came back and reached the top only to hold on to it for another three seasons. Once you have hit a peak, stay there. You can repeat your desire, skill, and progress if you just stay on top of the hill.